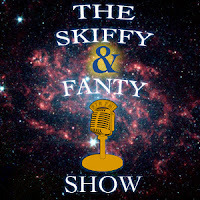 The Skiffy and Fanty Show is a weekly podcast run by Shaun Duke, Jen Zink, and Paul Weimer, three science fiction and fantasy nuts. The show covers anything and everything related to the science fiction and fantasy genres, with commentary on controversial topics and news in literature, film, and whatever else happens to hit us in the head that week. We also have the occasional interview with authors, scientists, and filmmakers. Links to available episodes can be found below. We are also on iTunes, which you can access here. We also have a Facebook fan page.